Tonight was the first of the Metropolitan Opera Guild's Met Mastersinger, celebrating the career of Renée Fleming. This season Renée will sing her 200th performance at the Met Opera. The event, at Town Hall on 43rd Street, was basically a youtube fest of past performances plus some taped commentary about Renée interspersed with an interview Renée by Paul Gruber. Videos included a scene from Convent Garden's "La Traviata" with Thomas Hampson filmed in 2009 and a recital scene from the upcoming film with Dmitri Hvorostovsky, vintage clips from Renée's first performance at the Richard Tucker Gala, the Letterman show, her first broadcast of Otello, and various other television appearances. A very entertaining short film of comments and stories by ubiquitous stage partner Susan Graham, colleagues Mary Lou Falcone, Peter Gelb, and fan and friend Barbara Cook was also shown. Susan shared hilarious stories of their time on stage including their plans for a retirement home "Cosi fan Tutte". It would have indeed been quite an evening if Suzy herself had conducted this interview. My personal favorite part was when Renée was asked about upcoming roles that she hopes or plans to sing in the near future. When she said "Ariadne," I heard our Chelsea yell out from her balcony seat: WHERE?!!! It was awesome. And I was so proud. The answer is Europe. 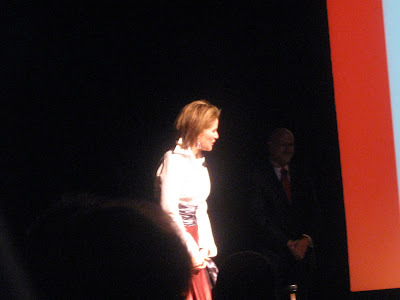 While it was a fun time and it's always exciting to be in the presence of La Diva, there was nothing particularly revelatory about the evening - any dedicated fan of Renée Fleming would have already seen the majority of the performance videos and we've heard or read most of what she had to say (and obviously don't mind hearing it again). 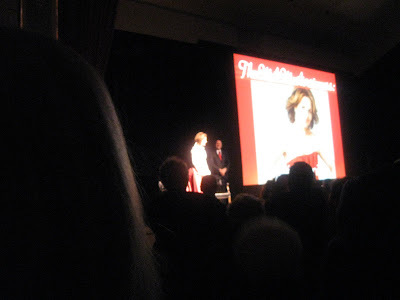 Conversely, as a dedicated fan, it was good to be there as she was deservedly celebrated by the Met Opera Guild. And of course, Chelsea is thrilled to get the news about "Ariadne" and has already begun a savings program and the process of applying for a passport. In the audience, we saw Marilyn Horne, Barbara Cook, Renee's dad & brother, some of Renée's ladies in waiting, various friends and people we've met because of Renee, and of course Lois Kirschenbaum, who was on a rare night away from the Met. I was also very happy to run into my friend Michael Stinchcomb, who is practically my entertainment twin. I was there too! I had never seen her speak before, and I loved how warm and funny she was. Two things: 1) If Suzie had hosted, we would've needed sunglasses from all the American girl sparkly-ness on stage. Can you even imagine??? 2) And hey man, if I don't shout out questions, how are we gonna get answers?